I always feel a little nervous about going on campus at Montgomery Bell Academy, a school where I had a, shall we say, less than auspicious exit midway through my (first) freshman year. But both the private school and I have done a lot of changing during the hrmmty-hrmmph years since my departure, and I’m pretty sure those cannons on the front lawn won’t be aimed at me when I return for the eighth annual Tennessee Local Food Summit. I attended last year and was very impressed by the scale of the event and the commitment of organizer Jeff Poppen, the Barefoot Farmer and his staff of volunteers. This year’s summit will run Nov. 30-Dec. 2 and feature national and local speakers focusing on issues regarding health and wellness, food security and the restoration of local farms. 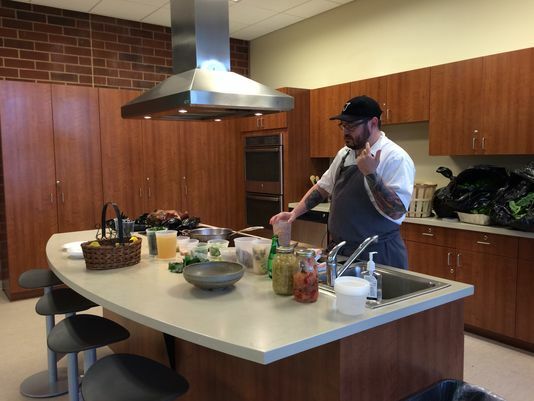 There will also be chef demos and meals prepared by several forward-thinking local favorites. You can check out the schedule for the entire conference at the event website, and tickets (which include all workshops, meals and free parking) are $100 each and can be purchased at Eventbrite in advance. Day tickets are also available. MBA headmaster Brad Gioia is proud that students from the school’s Entrepreneurship, Health and Wellness, and Conservation societies will take part in the conference sessions as well as provide manpower for the event, and that the school can host again. He’s a good man, that one. See, I told you we both had grown! You’d think with all the whiskey that has been produced in Tennessee at distilleries like Jack Daniel’s and George Dickel since Prohibition, there would be a market for local malted barley, since that grain is almost always a component of the mash bill of whiskey recipes. Then add in the rise of Tennessee breweries, where barley is an even larger percentage of the recipe than with spirits, and it seems like a no-brainer that barley should be a big cash crop in the state. The more preferred variety of barley for brewing and distilling is two-row barley, with its lower protein levels, higher yield per pound and more refined flavors, factors that are apparently unimportant to cattle. Still, Whitt wanted to bring barley back, and the agriculture sciences department at Virginia Tech had been experimenting with strains of German two-row winter barleys like Flavia, Calypso and Videtta, which are hearty enough to survive in Tennessee’s fickle climate. The first major announcement coming out of this program is a product from Tennessee Brew Works, called State Park Blonde Ale, which TBW has brewed since 2017 as a fundraiser benefiting the Tennessee State Parks Conservancy and our system of 56 state parks. Starting with this year’s release, State Park Blonde Ale will be brewed using all Tennessee-sourced grains. “By utilizing all-Tennessee grains, we are creating beer that is truly indigenous to our home. Using the State Park Blonde Ale to launch the effort provides an opportunity to benefit the Tennessee State Parks as well,” says Christian Spears, Tennessee Brew Works’ founder and president. Currently, Batey is targeting homebrewers and smaller breweries with barley under the Volunteer Mission malt brand, which they grow and harvest from their farm, and send to North Carolina to be malted and then packaged into 50-pound bags or 1-ton totes for industrial use. Their goal is to build their own malting facility very soon so they can malt and roast the barley to create custom flavor profiles. Since the malting process is basically soaking a seed until it begins to sprout, releasing the enzymes that help kick off fermentation when combined with yeast and sugar, Whitt is also considering building the facility to be able to handle other sprouted grains for the culinary industry. A graduate of MTSU, Whitt also serves on the advisory board of the new Fermentation Sciences program at the university and plans to establish more opportunities for students to develop skills related to malting, brewing and distilling through his industry connections. And you thought malt was just about milk balls and Schlitz? There’s a world of malt out there, and hopefully Tennessee can be a part of the future. If you’re interested in learning more about this initiative, Spears and Whitt will be speaking about reinvigorating the state’s malted barley tradition as part of the Tennessee Local Food Summit. To reach this vision, Poppen has gathered multiple panels of local, regional and national food and farm advocates for educational workshops and networking opportunities. Some of Nashville’s best and most forward-thinking chefs will also participate in the panels and prepare meals for attendees. Poppen has been an advocate for local food for more than four decades, growing his own food and selling his wares from one of the oldest and largest organic farms in Tennessee, Long Hungry Creek Farm in Red Boiling Springs. But don’t get the impression that this summit is just a meeting of old tie-died hippies advocating some sort of return to agrarianism. The Tennessee Local Food Summit is dead serious about improving the economics of local food production and consumption and has invited one of the most respected food systems analysts in the country to address the conference. Ken Meter is known for his work that integrates the technical sides of business development and marketing analysis with the fuzzier concepts of social concerns and development of successful systems. He has undertaken an analysis of the Nashville food system and will be talking about his findings as part of the summit. Other local and regional experts who will participate in educational sessions include Tradd Cotter from Mushroom Mountain; Ian McSweeney, executive director of Russell Farm and Forest Conservation Foundation; Mac Wilson of Community Garden; Susana Lein of Salamander Springs Farm; Robin Fazio of the Baylor School; Paul Bela of Hill & Hollow Farm; Jay Williams of Williams Honey Farm; Loran Shallenberger of Bells Bend Farms; Alfred Farris of Windy Acres Farm; Bill Kenner of Sequatchie Cove Farm; and Tasha Kennard of the Nashville Farmers’ Market. Go to the official event website for a full schedule of seminars. Nashville chefs participating in cooking demonstrations include Tandy Wilson from City House, Julia Sullivan from Henrietta Red, Eric Zizka of Oak Steakhouse and Tony Galzin from Nicky’s Coal Fired, and meals will be provided by local partners Husk Nashville and Lockeland Table. The Tennessee Local Food Summit will take advantage of many of the facilities at the host venue, Montgomery Bell Academy’s campus. Events will take place in the school’s Hogwarts-like dining hall, also utilizing MBA’s kitchens, classrooms, and lecture halls. Students from MBA’s entrepreneurship, health and wellness, and conservation societies will take part in the conference sessions, as well as providing volunteer manpower for the weekend. Free parking will be available in the MBA parking garage off Wilson Boulevard. Other workshops will be offered in topics ranging from backyard and community gardening, online marketing, the effects of agriculture on the environment, and more. Tickets for conference, which include all workshops, meals and free parking, are $75 each and can be purchased at Eventbrite in advance. This is an incredibly affordable admission for the chance to take part in this vitally important discussion for our community while learning and networking from some amazing experts in the field and enjoying food prepared by local heroes. Don’t dawdle on this one. Sign up for your tickets today! Seventh Annual Tennessee Local Food Summit will be held Dec. 1-3 at Montgomery Bell Academy. The event features local, regional and national food and farm advocates including Nashville’s best chefs showcasing delicious, locally grown organic meals, educational workshops, networking and the celebration of Nashville’s growing local food movement. This year’s event features Ken Meter, one of the most experienced food system analysts in the United States. His work integrates market analysis, business development, systems thinking, and social concerns. Ken will be reviewing and discussing the Nashville Food System Analysis Report. Additionally, local and regional experts will participate in sessions, including, Tradd Cotter from Mushroom Mountain, Ian McSweeney, Executive Director of Russell Farm and Forest Conservation Foundation, Mac Wilson of Community Garden, Susana Lein of Salamander Springs Farm, Robin Fazio of the Baylor School, Paul Bela of Hill & Hollow Farm, Jay Williams of Williams Honey Farm, Loran Shallenberger of Bells Bend Farms, Alfred Farris of Windy Acres Farm, Bill Kenner of Sequatchie Cove Farm and Tasha Kennard of the Nashville Farmer’s Market. A complete schedule can be found on our website, http://www.tnlocalfood.com. Nashville Chefs Tandy Wilson from City House, Julia Sullivan from Henrietta Red, Eric Zizka of Oak Steakhouse and Tony Galzin from Nicky’s Coal Fired will be participating in cooking demonstrations, along with featured meals provided by local partners Husk Nashville and Lockeland Table. The Tennessee Local Food Summit will make use of several areas of the Montgomery Bell Academy campus, including the school’s Dining Hall, kitchens, classrooms, and lecture halls. Students from the MBA Entrepreneurship, Health and Wellness, and Conservation Societies will take part in the conference sessions as well as provide manpower for the event. Parking will be available in the MBA parking garage off Wilson Boulevard. “MBA is thrilled to serve as host for Tennessee Local Food Summit. The event and its mission provides a great opportunity for our boys to see the impact that the local food movement can have on our community. Last year, our students provided more than 4,800 hours of volunteer service to 26 organizations in the area, and we see MBA’s involvement in the Local Food Summit as a continuation of the school’s commitment to serving Middle Tennessee,” said MBA Headmaster Brad Gioia. During the three-day event, workshops will be offered in backyard and community gardening, online marketing, the effects of agriculture on the environment and more. Tickets for conference which include all workshops, meals and free parking are $75 each and can be purchased at Eventbrite in advance. As a peak year-end event fostering this change, the Tennessee Local Food Summit is December 1-3, 2017 and will be held at Montgomery Bell Academy, sponsored by Barefoot Farmer, LLC and the Community Foundation of Middle Tennessee, Nashville Food Project, Nashville Grown and Vanderbilt Rooted Community Health. For more information, visit: www.tnlocalfood.com. Montgomery Bell Academy is the oldest independent school for boys in Tennessee. Since 1867, the school has been dedicated to the ideal of helping young men reach their potential as gentlemen, scholars, and athletes. MBA is home to 15 National Merit Semifinalists, the top-ranked debate team in the country, the 2017 One-Act Play State Champions, and 16 varsity sports competing at the highest level. “Barefoot Farmer” Jeff Poppen, host of Nashville Public Television’s long-running programVolunteer Gardener and one of the nation’s leading authorities on organic farming, will join a host of national experts on organic farming and nutrition, including award-winning local chefs, for a series of workshops and cooking demonstrations at the 2014 Tennessee Local Food Summit Dec. 5, 6 and 7 at Vanderbilt University. The three-day event kicks off with dinner and music on the grounds of Vanderbilt Dyer Observatory, followed by workshops at the Vanderbilt Recreation and Wellness Center, a concert and dinner at The University Club of Nashville, and on-site workshops at Bells Bend Neighborhood Farms. The community event is being hosted by Health Plus, a division of Vanderbilt Health and Wellness, which houses three nationally recognized programs that provide support for the health and productivity of university employees as well as people throughout the Middle Tennessee region. Registration for the summit and more information about this year’s speakers and workshops is available online at TNLocalFoodSummit. Space is limited, so early registration is strongly encouraged. Poppen operates one of the oldest and largest organic farms in Tennessee, writes a local column about his organic farming musings for the Macon County Chronicle, hosts a popular public television program on WNPT and is the author of two books. The Farm to Table movement has received growing national attention in recent decades as consumers have become more aware of the health, nutritional and local economic benefits of buying direct from local farms. Even larger, more established food service companies and grocery store chains are now offering their customers more fresh, locally grown produce and farm products. In addition to Poppen, this year’s event will feature experts and chefs speaking on a wide range of topics from backyard gardening, organic agriculture, rural economies, and nutrition to cooking and climate change. Ken Meter, president of the Crossroads Research Center in Minneapolis. Meter is one of the foremost foods systems analysts in the nation, serving as a consultant to the United States Department of Agriculture, the U.S. Environmental Protection Agency, the Minnesota Pollution Control Agency and several universities. Steve M. Johnson, medical director of Evergreen Medical Centre in Louisville, Kentucky. Johnson is a pioneer in the field of integrative medicine with a special focus on the connection of rational spiritual medicine to health. Hugh Williams, an organic and biodynamic farmer for more than 40 years. Williams is an expert orchardist who is widely respected for his experience running successful fruit businesses and a self-contained farm. John Ikerd, professor of agriculture and applied economics at the University of Missouri. Ikerd is an expert on sustainability, agriculture and economics and how the three are related. Mark Bader, owner of Free Choice Enterprises. With expertise in ruminants and grazing concerns, Bader travels the world advising livestock owners on pasture-performance issues. Richard McDonald, also known as “Dr. Bug,” is a leading expert in organic pest management. He works as the biological control administrator and state apiarist for the North Carolina Department of Agriculture. Hugh Lovell, an author and expert on the origins and developments of biodynamic farming, soil health and sustainable agriculture. Susana Lein speaking on Permaculture. Sandor Katz, author of Art of Fermentation. For more information on the 2014 Tennessee Local Food Summit and to register, visitTNLocalFoodSummit. Chef Sean Brock welcomes the winter challenge of turning the abundance of seasonal root vegetables and greens into something exciting to eat day after day. Brock, the chef at Husk restaurant in Nashville, explained and demonstrated his philosophy on eating foods that are in season Saturday during the Tennessee Local Food Summit. Brock grew up eating with the seasons out of necessity, and it continues to impact how he thinks about and handles food. He was raised in rural Virginia far from any restaurants. “You had to cook at home every single day. We grew everything, and I thought everyone did that. I was so far back in the mountains that I just assumed that’s how people lived,” Brock said. Incorporating seasonal foods into daily dishes was one of many topics discussed at this year’s Tennessee Local Food Summit. In addition to the kitchen, the summit’s workshops focuses on science, gardening, economics and spirituality. The Tennessee Local Food Summit was started by farmer Jeff Poppen in an effort to promote local, organic farming as a solution to climate change. Vanderbilt University’s staff and faculty wellness program, Health Plus, hosted this year’s program at the Vanderbilt Recreation and Wellness Center because it matched well with the organization’s mission, said Brad Awalt, manager of Health Plus. The summit continues Sunday with more workshops and a farm tour. Visittnlocalfood.com for more information. 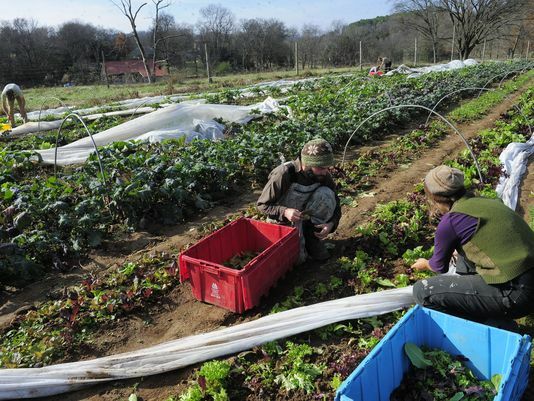 The Tennessee Local Food Summit invites food-lovers to celebrate farming and agriculture, kicking off with a chef-prepared dinner 6 p.m. Friday at the Vanderbilt Dyer Observatory, 1000 Oman Drive. Saturday is filled with chef demos in workshops from 9 a.m.-5 p.m. at the Vanderbilt Recreation and Wellness Center, 2700 Children’s Way, followed by dinner at the University Club of Nashville, 2402 Garland Ave. The conference concludes with a tour of Bells Bend Farms at 10 a.m. Tickets range from $25-$125. Register at www.tnlocalfood.com or 615-322-6384. Middle Tennessee has long been known for providing excellent produce and proteins, but so many local residents still don’t take advantage of our fertile farmland. The upcoming Tennessee Local Food Summitaims to shine a spotlight on these issues during their upcoming series of events Dec. 5-7. The summit, sponsored this year by Vanderbilt Health and Wellness, will offer opportunities to hear local chefs and farmers discuss strategies to better utilize indigenous products in our daily food preparation and will feature chefs preparing delicious meals using locally grown ingredients.The event will kick off on Friday, Dec. 5, with a chefs’ dinner at Vanderbilt’s Dyer Observatory, with a reception and a meal, plus musical entertainment by Beth Nielsen Chapman and Will Kimbrough. The participating chefs include: Andy Manchester, executive pastry chef at the Omni Hotel; Guerry McComas, executive chef of Nashville Restaurant Group; Jeremy Barlow, owner of Sloco and author of Chefs Can Save the World; Kristin Beringson, executive chef at City Winery Nashville; Laura Wilson, executive chef of the Grow Local Kitchen in the Nashville Farmers’ Market; and Richard Jones, executive chef at Green Door Gourmet. On Saturday night, the University Club is the site of another chefs’ dinner with live music by Darrell Scott and friends. The summit concludes on Sunday with a tour of Bells Bend Farms. You can purchase tickets to the entire conference or take advantage of à la carte opportunities by visiting the event’s ticketing page. Promoting the local production and consumption of healthy local food for everyone is why for the last three years organic farmer Jeff Poppen takes time away from tending to his vegetable fields, blueberries, apples, beehives and cattle in Red Boiling Springs to organize the Tennessee Local Food Summit in Nashville, an event that brings in over 200 attendees each year. “A local food economy can solve a lot of problems,” said Poppen. “When people eat fresh produce and items fresh from the farm that are raised from wise, traditional methods the food is better for people and people are healthier. The environmental consequences are a lot less than having a few giant agricultural facilities. There are also social impacts on the community.” Small farms bring employment for people to work the land. With this, education and spiritual values are heightened, explains Poppen. He knows there are obstacles but he believes that people coming together to find pathways to foster a local organic food system is the only way to move forward. Poppen is excited to see local chefs take part and share what can be done with the food. Also known as “The Barefoot Farmer,” Poppen has hosted events celebrating homegrown food for thirty years at his Red Boiling Springs farms. “People would talk about what was on their hearts and I thought what a good idea to have this kind of thing in Nashville,” said Poppen. So in 2011 he approached Dodd Galbreath of Lipscomb University who hosted the summit the first year. Sylvia Ganier of Green Door Gourmet hosted the summit in 2012, and Jason Adkins of Trevecca Nazarene University will host the Saturday workshops this year. Poppen likes to move the summit to a different venue each year to showcase the local food economy in middle Tennessee. He is honored so many universities and businesses want to take part. As a boy, Poppen watched his father tend his organic farm in Illinois. When he was 18 he moved to Tennessee to become a farmer himself. Poppen has two tracts of land in Red Boiling Springs. One is about 15 acres which he is considering transitioning to an education and retreat center after he made the decision not to farm there when a confined animal feeding operation for chickens moved near the property last year. His second farm is over 200 acres and is where he raises his cattle and grows a variety of vegetables including greens, corn, potatoes, watermelons, squash and herbs for his 150-member CSA and local restaurants. Poppen has published two books and does consulting for other farmers and gardeners. The Tennessee Local Food Summit begins Friday December 6 with a 6 p.m. reception at Sloco, 2905 12th Ave. S., Nashville, TN 37204. The workshops on Saturday, December 7 begin at 9:00 a.m. December 7 at the Boone Business Building at Trevecca Nazarene University, 333 Murfreesboro Road, Nashville, TN 37210, and include a chef-made lunch. Saturday night at 6 p.m., Corsair Distillery will host summit attendees for a farm-to-table dinner and entertainment by indie rocker Will Kimbrough. Sunday, December 8, at 10 a.m., it’s back to Trevecca for a tour of the aquaponics operation followed by a tour of Delvin Farms greenhouses at noon. The full price of the three-day summit is $100 per person but discounts and single event tickets are also available. Tennessee Local Food Summit participants who attend speaker Jason Adkins’ workshop or tour Trevecca Urban Farm, will learn how Trevecca Nazarene University students are nurturing seedlings to replant in area low-income neighborhoods and community and school gardens, raising chickens for eggs and growing tilapia fish using aquaponic methods, just a few of the programs that are part of the school’s Center for Social Justice program whose mission is to help all people have access to healthy, affordable food. Adkins, the university’s Environmental Projects Coordinator will speak at the summit’s December 7 10:45 a.m. workshop, “Exploring Environmental Justice Through Urban Farming in a Food Desert,” and the next day at 10 a.m. summit attendees will get to take a tour of Trevecca Urban Farm. The workshop will talk specifically about the farm’s practices and how it was incorporated in to a whole educational farm, the relationships they have with the community and farmers as well as how they are teaching the farm’s programs to locals and as to students as far away as to their sister university in Asia. Other programs at Trevecca Urban Farm include students composting food scraps from the university’s food service to create mulch for their farm projects, a worm depository that creates fertilizers to nourish farm plants, helping to restore Brown’s Creek, planting fruit trees and bushes on campus and in the Chestnut Hill neighborhood, beekeeping, creating community and school gardens, and growing and deploying cleansing plants at local schools to increase better air quality. The Center for Social Justice tries to advocate for people to become more interested in farming. “We need more farmers, more people on the land,” said Adkins. He said they want people, especially students, to equate farmers as having “honorable and viable vocations. We need to support it all the way up to the higher education so we get the kind of students who seek it in higher education who feel inspired to take up the vocation and make it so it’s economically sustainable.” The workshop will also talk about farm-to-school programs and the importance of people taking to young people about eating right and challenging them to grow their own food. The third annual summit begins Friday December 6 with a 6 p.m. reception at Sloco, 2905 12th Ave. S., Nashville, TN 37204. The workshops on Saturday, December 7 begin at 9:00 a.m. December 7 at the Boone Business Building at Trevecca Nazarene University, 333 Murfreesboro Road, Nashville, TN 37210, and include a chef-made lunch. Saturday night at 6 p.m., Corsair Distillery will host summit attendees for a farm-to-table dinner and entertainment by indie rocker Will Kimbrough. Sunday, December 8, at 10 a.m., it’s back to Trevecca for a tour of the aquaponics operation followed by a tour of Delvin Farms greenhouses at noon. The full price of the three-day summit is $100 per person but discounts and single event tickets are also available. For more information about the Tennessee Local Food Summit, go to tnlocalfood.com. To learn more about Jason Adkins and the Trevecca Urban Farm go to tnurbanfarm.org.